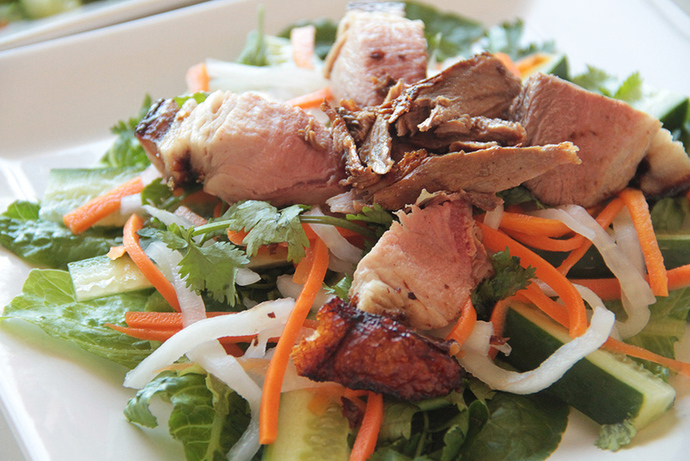 This dish captures the essence of a Vietnamese pork roll on a plate. 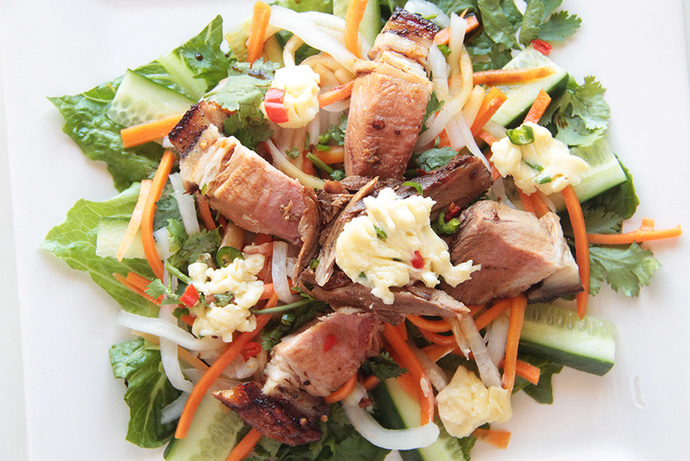 It's fresh, colourful and overflowing with delectable flavours. 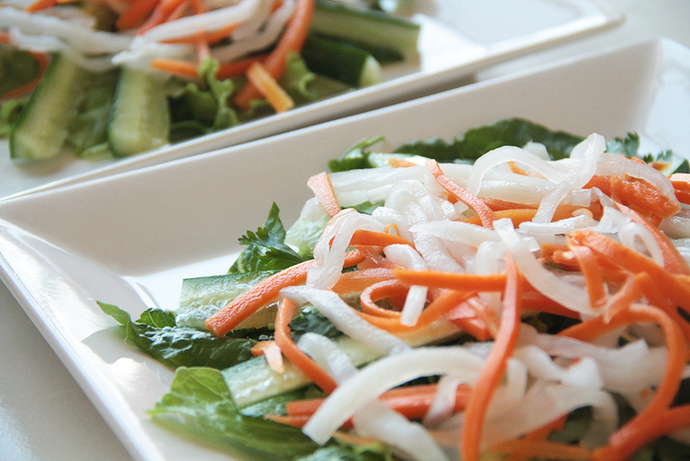 A traditional Banh Mi doesn't include lettuce, but this worked as a good base for the salad. 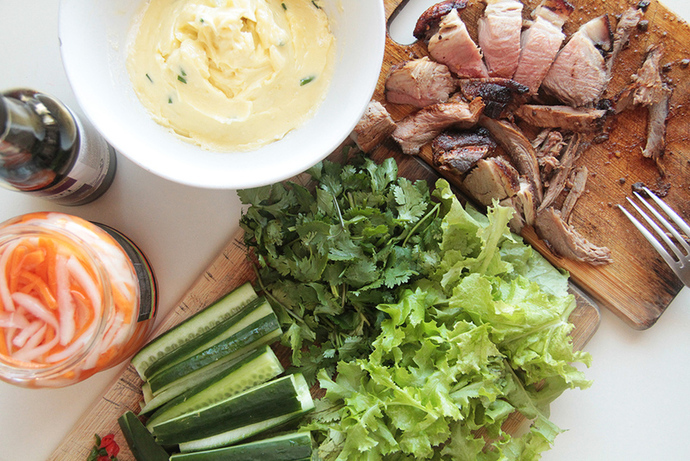 Banh Mi often contains liver pate, so feel free to add some if that tickles your fancy. The recipe below involves a lot of preparation (across more than one day), but it can be tweaked to be more easy. 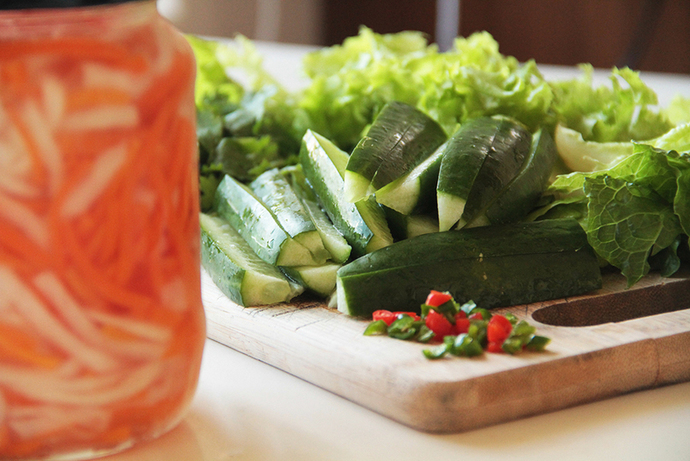 Don't want to make your own 'do chua' (pickled radish and carrots)? Just chop up fresh carrots and daikon radish. Don't want to do a roast pork? 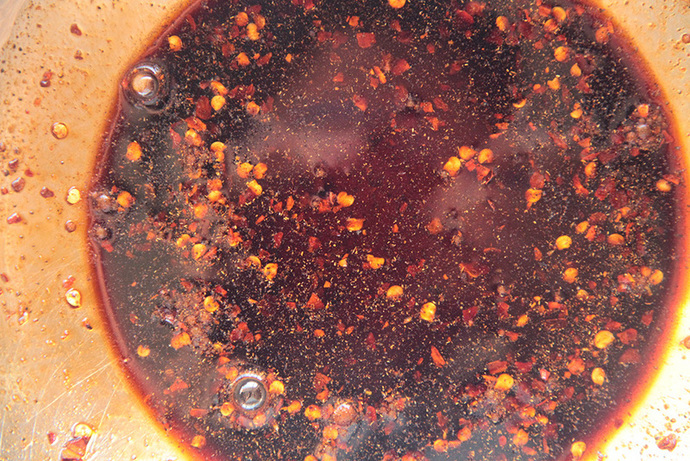 Rub the marinade into pork, chicken or beef pieces, then fry in a dash of oil. Don't have fresh chillies? Scatter over chilli flakes. If you decide to do a roast, it's a good idea to roast a large piece of meat (as I've indicated below for the marinade) and use leftovers for future dishes. You can play around with the measurements of all the ingredients, as you may prefer less coriander yet more chilli, etc. At least a week before you plan to serve the salad, prepare the pickled carrots and daikon radish. I followed this recipe, but omitted the sugar and salt and it was delicious. Feel free to skip this step, as outlined in the intro. 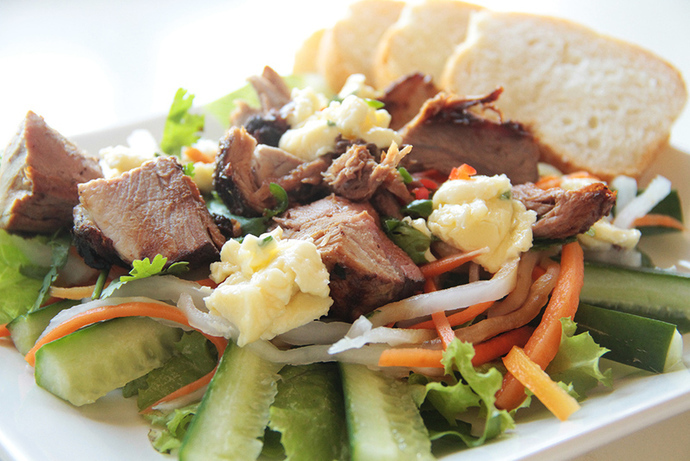 The day prior to serving the salad, mix the marinade ingredients in a large bowl. Score the pork shoulder skin diagonally, then place the meat into the bowl. Rub the marinade all over the shoulder. Cover with cling wrap and leave in the fridge overnight. This step can also be skipped if not using roast meat in the salad. On the day you will serve the salad, preheat the oven to 220°C. 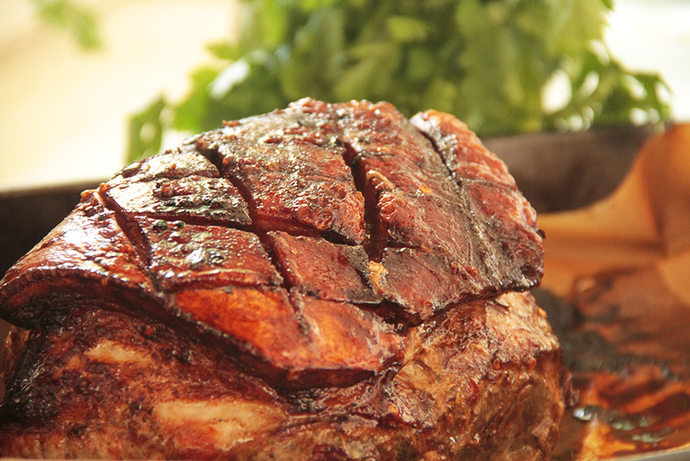 When the oven is ready, take the pork shoulder out of the fridge and place on a baking tray lined with baking paper. Place in the oven for 30-45 minutes, then change the temperature to 180°C and cook for roughly 15 minutes per 500g. Take out when cooked through and still somewhat pink in the centre. Cover with foil for at least 10 minutes. Cooking times may vary. We put the shoulder in at 220 for 30 minutes, then for 45 minutes at 180 and the meat was perfectly cooked. To prepare the salad, lay the ingredients out on a table or bench. 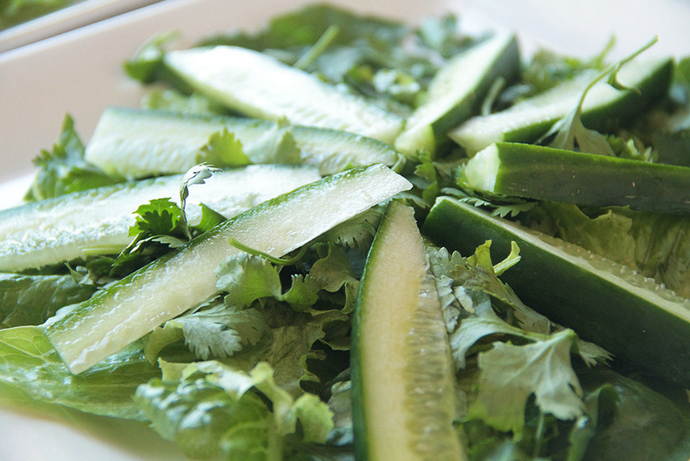 Cut off the ends of the cucumber and chop in half, then into 1cm thick strips. Finely chop the chilli. Cut the pork into 2-3cm pieces. 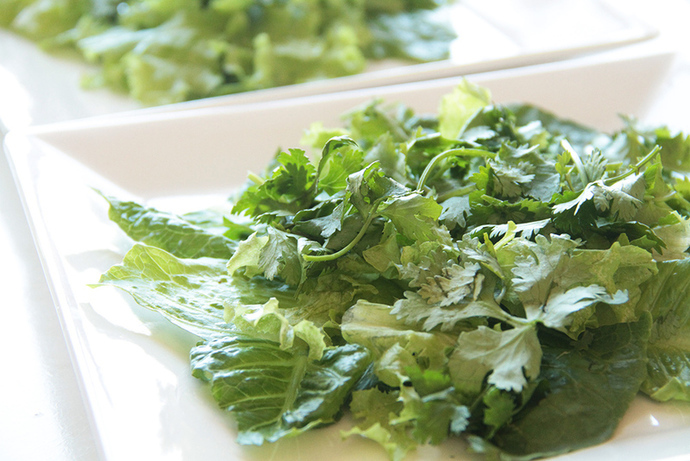 Place the lettuce on your plates, then sprinkle one quarter of the coriander over each plate. Lay out half the cucumber on each plate. Top with the pickled carrot and radish. Place the rest of the coriander on the plates, then top with the pork pieces. 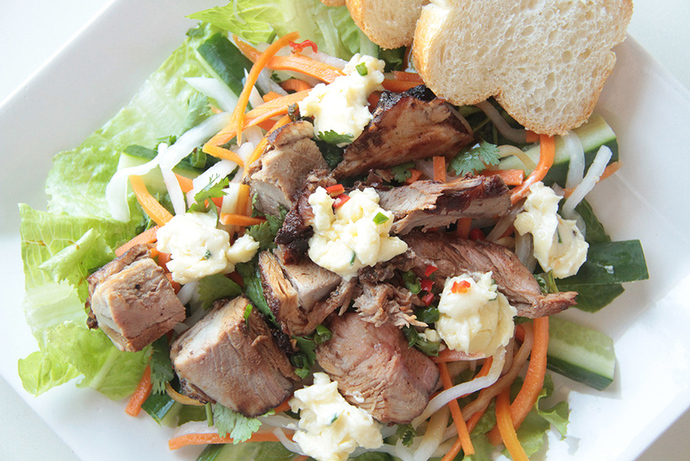 Drizzle the tamari sauce over the salad. Using a teaspoon, drop dollops of the mayonnaise across the plates. Scatter the chilli pieces over the top. Place Vietnamese bread roll slices on the side, if using.